IDwebhost Review 2019: Is IDwebhost a Good Hosting? IDwebhost is a leading Indonesian hosting provider with more than 100,000 customers. There’s little support for advanced users, however, the affordable plans come with everything a beginner needs to get started. IDwebhost has been providing Indonesian website hosting since 2004. The modern website is provided in Indonesian. It’s one of the leading hosting providers in Indonesia, with more than 100,000 customers from around the world. It claims to be a cheap provider, so it will be interesting to find out if this top company lives up to its reputation. In terms of its infrastructure, IDwebhost has multiple servers in data centers located around the world. The servers run on Litespeed Web Server, CloudLinux, and for WordPress users, Litespeed cache facility to make your website up to 50 times faster. There is a 99.9% uptime guarantee, however, it’s not backed by an SLA. There are a lot of value added features for beginners. IDwebhost provides a free (for six months) website building tool with more than 300 templates included, as well as a Softaculous installation with more than 90 programs. If you’re an e-commerce store, there’s a free WooCommerce plugin for WordPress websites. For experts, there’s support for PHP version 5 and 7, as well as CGI, FTP accounts, MySQL, and phpMyAdmin, however, there’s no SSH access or support for other advanced coding languages. Cron jobs are enabled, so you can setup up automatic scripts. There’s quite a few security features which come out of the box such as CageFS, Anti Virus, and Anti Malware Systems, but nothing too outstanding, apart from the added bonus of Cloudflare CDN. As the website claims, the prices are cheap. There are five packages and as the prices increase, you get more value added features and more resources. To benefit from the website building tool, you do need to upgrade to one of the pricier higher-tier packages. This is where it gets complicated. SSL certificates are in free in all but the cheapest plan, you get one year free domain in the second cheapest plan, and a forever free domain in the three upper packages. Plans can be bought in one, two, or three year increments. The price is substantially reduced if you buy a longer term upfront. There’s a 30-day money-back guarantee, which goes some way to counter the long term commitments. Customer service, as you would expect with a large host, is 24/7 via live chat. There are local Yogyakarta, Jakarta, and Semarang phone numbers with business hours from Monday to Friday 8:00 a.m. to 4:00 p.m. There are lots of tutorials on the website, which is great for beginners and new website owners. I contacted them on live chat at 10:00 p.m. local time and the operator picked up straight away. He was helpful and answered my questions within a couple of minutes. As well as being polite, he was happy to chat with me in English. IDwebhost has offices in Yogyakarta, Jakarta, and Semarang and more than 122,000 active domains, supported by more than 100 servers. 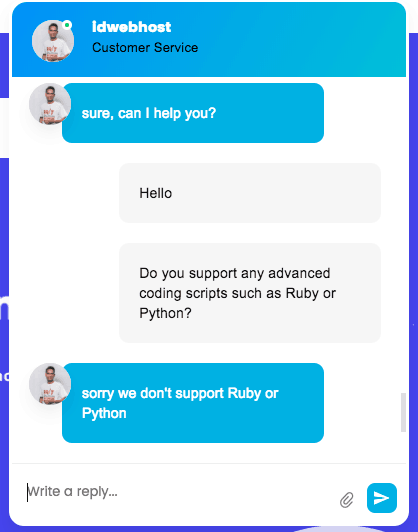 Experts won’t get tons of support for advanced coding languages, however, beginners will benefit from a website building tool, e-commerce integrations, and helpful tutorials. Given the low price and excellent customer service, I can see why it’s grown to be a leading provider. Wondering how IDwebhost stacks up against other Web Hosting companies? Enter any other Web Hosting company and we will give you a side-by-side comparison.